The Government made a diagnosis on the mountainous area of ​​Bolivia. 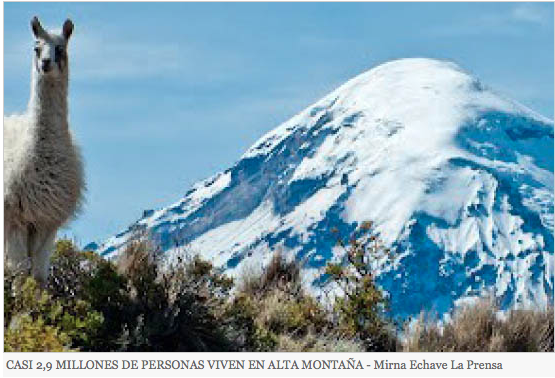 In Bolivia, 2.9 million people live at locations above 3,500 meters above sea level, according to the Prime Diagnostic Mountain Area, prepared by the Ministry of Foreign Affairs. According to the study, one third of the country is mountainous, which besides having potentially productive activities, deterioration caused by human activity is observed. The diagnosis was developed in implementation of the project Strengthening Participatory Management for Sustainable Development in the Andes, powered by FAO. STUDY RECOMMENDS TO CREATE AN INTER WORK COMMITTEE AROUND THE MOUNTAIN AREAS OF THE COUNTRY. This entry was posted in Art, Bolivia, Business, Cochabamba, Economics, Energy, Environment, Health, Holidays, La Paz, Mining, Politics, Potosi, Tourism and tagged Chuquisaca, FAO, high altitude, Oruro, Tarija. Bookmark the permalink.